This activity was inspired by a video tweet from Margaret A. Powers @mpowers3. I knew my students would love helping Dash plow "snow"! Pic from the Wonder Workshop site. This activity uses the optional bulldozer bar attachment from the Wonder Pack or Accessories Pack. I have 2 of these attachments and set up an area in my room for 2 groups of students to try the challenge. I create a short Animoto video to engage the students and give directions for the Dash on Snow Patrol challenge. I then created a QR code for the video and placed it on a challenge card. #1 You can't pick up Dash! It would be too easy to pick Dash up every time they code didn't work out. #2 You must use code to move Dash! Basically, restating rule #1! #3 You need to clear all the snow! This was harder than they thought! #4 Have fun! I heard lots of struggles and lots of cheers during this challenge! I created a snow collection area using Painter's tape and a printed sign. It was great to see students using the five principles of computer science learning: creating, communicating, critical thinking, problem solving, and persistence. I can't wait to do more fun learning challenges with Dash and my students! Last week, I had the opportunity to attend an FETC Featured Speaker session on Augmented Reality lead by Drew Minock and Brad Waid. They are also know as Two Guys and Some iPads. I had seen and dabbled in a few Augmented Reality apps, but was blown away by their session. They demonstrated everything from spinning planets and solar systems to a beating heart with blood pumping through it that seemed to "appear" out of thin air! If you are intrigued, be sure to check out webmixes below and the Two Guys and Some iPads site! I will be posting more on the topic of Augmented Reality soon! Once my 1st graders were comfortable pairing Dash to the iPad, making Dash go to “sleep”, and adding move forward and backward blocks, I knew it was time for more. I decided to have the students focus on turning and not on having Dash move forward or backward for the beginning of this lesson. Dash facing the back wall. They placed Dash facing the back wall of my room and coded Dash to turn Left 90. They were excited to see that Dash was now facing a different wall. They repeated this process, but had Dash turn Left 180. Dash after a Turn Left 90. I knew this simple lesson was a powerful one when one 1st grade girl said, “That 180 was two 90 turns put together!” And another student made the connection to the Teaching Loops with the Beats Project lesson we did earlier this year. She said, "Dash is turning just like we turned in our dance loop!" I then asked them to make predictions for Left 270 and 360. It was amazing how quickly they understood where Dash would face at the end of each turn. Next, we talked about making Dash turn right and do the same movements. I was exciting to see lots of light bulbs going off for students. Left and right in coding can be very hard when a character is 2 Dimensional. Coding and seeing Dash move in relation to the room really brought the concepts home to students. I created a handout for groups to record their findings. I didn’t use the handout with all of my classes, but it does help to give students in groups of 3-4 different jobs to be accountable for. Once they were comfortable with turns, I let them have free time to explore all of the blocks we had learned and add in sounds and other fun blocks. Do you have an angle or coding lesson involving turns that you use often? I would love to hear about it! Hope you enjoyed our session, 50 Technology Treasures: 2015 Edition at FETC! We loved sharing with you! Here is the presentation with links to all the treasures. Enjoy! 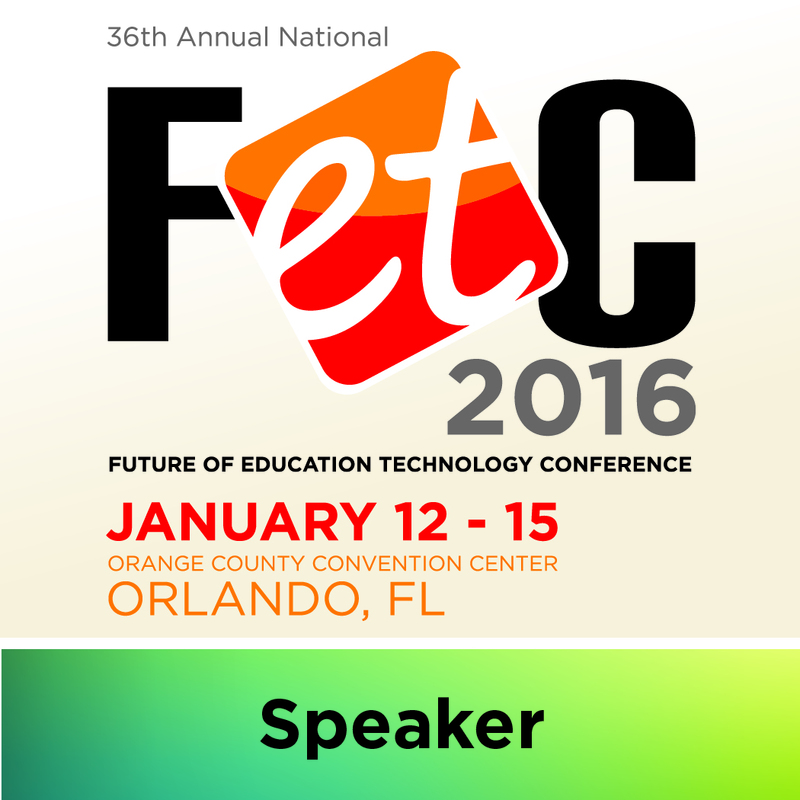 It was an honor to be presenting at FETC again this year! Thanks for having us! Last week, I shared a one iPad Classroom Symbaloo webmix. I thought it would be a good idea to write a few posts to share why I selected each app or site. Today, I'm focusing on the nine teacher productivity apps I included. If you want to find one of the apps, use the above widget to find the apps in the iTunes store. The Random Name Selector Pro app ($2.99) is a fantastic way to randomly call on students right from your iPad. Students love seeing their name in the themes like movie star or underwater. Teachers can deselect a student for a day if they are absent. I use the Reflector app to display how is being called on. The Class Dojo app (free) is great for classroom management. You create a class and add your students, then you can give or take away points for student behaviors. Check out my Class Dojo blog post for more information. The Roundom Decision Maker app (free w/in app purchases) will end debates in the classroom. Enter your options and spin to find an answer. Need to select a new class book or which activity to do next, use this app! It would also be great to help groups know which job goes first. The Classroom Timer Lite app (free) encourages students to complete tasks in a timely manner. It can be set to give positive feedback when a task is completed on time. Scoreboard Pro app ($.99) is perfect for scoring classroom games. Project so everyone can see and have a student update the app with each point scored in a classroom game. Too Noisy Pro ($2.99) is a fun way to help students monitor the noise level in the classroom. Use the Plickers app along with printed Plicker sheets to quickly gauge student understanding. Students hold up a card, face it one of four directions, and the teacher uses the app to quickly scan the room. The app then provides instant feedback. Dropbox (free) is one of my most used apps on my iPad, iPhone, and compute desktop. I LOVE how easily I can transfer files between devices using Dropbox. I could add other teacher productive apps to this list, but I wanted to limit the apps to free or low cost apps. Do you have a favorite teacher productivity app? I would love to add it to my list! Many of my students are preparing for our school science fair right now. This got me thinking about using Dash to practice the scientific method. During the Hour of Code week, we noticed the speed seem to change how dash moved through our tape maze. Dash seemed to move different distances. I decided the distance Dash travels at various speeds would be a perfect thing for my students to put to the test using the scientific method. We discussed what the variables in the experiment could be (speed or distance) and decided to use speed. Next, we talked about writing a hypothesis for the experiment. For example: If Dash is set to very fast, then the distance traveled will stay the same. Then, each group spent some time collaborating and writing. Each group was given a recording sheet, clipboard, pencil, flexible tape measure, pushpin, iPad, and Dash. Each group selected a consistent number of steps for Dash to move. We aslo talked about running three tests for each speed. I had the kids pin the tape measure to the floor for ease of measuring. We also talked about placing Dash in the exact same starting spot for each test. We already had tape on the floor for group areas that worked nicely. The kids really go into doing the tests and recording their findings. Things generally went smoothly, until the kids tired the very slow speed. Dash went 4-5 times farther and often curved while driving at that speed. This made measuring very difficult! We decided to move to the hallway and see if we could get an accurate measurement. We had fun running the trial several times as a group with a couple different robots. We never could get a straight enough trial to measure it! Even though most of the predictions didn’t match the results, the kids learned so much about experiments and testing ideas. Download the recording sheet here. I was thinking it would be really cool to collect data from several different schools and have the kids compare. If you would have any interest in doing this, please leave a comment on this blog or tweet me @fabprab! I have enjoyed the using the Path app with my Kindergarteners, but feel like it would be limiting to my 1st graders. I decided to go ahead and try using the Blockly app with 1st grade-5th grade students. I knew my 2nd-5th grade students would dive into the app with no issues. I wasn't sure if my 1st graders would struggle with the Blockly app, which is full of code blocks with text labels on them. I started by having the students sit in small groups using the same tape squares I showed in my previous post. We then went over how to pair the iPad with a specific robot and how to find and drag a code blocks in the app. I had them focus on only two code blocks: When top button and Forward. I had the kids take turns making Dash move. We then talked about changing the number of steps Dash could move. 1st Graders working in groups using the Blockly app and Dash. Challenge #1: Move Dash from one end of the tape square to the other. At this point, I decided to give the kids a simple challenge. Place Dash at one end of the square and use code to move the robot to the other side of the square. I didn't say anything else. Most groups pressed the top button repeatedly and moved Dash across the square. Challenge #2: Move Dash the same distance using only one button press. "Can you move Dash across the square with one press of the Top Button?" Challenge #3: In one button press, move Dash across and back to the starting place. "Can you move Dash across the square and back to the start with one press of the Top Button?" I purposely don't talk about whether the robot needs to turn around or not. It's fun to hear a group discover the Backward block and use it to accomplish this challenge. Challenge #4: Do Challenge #3 using fewer blocks. The kids loved this challenge, but it required a bit of coaching on my part. Older graders could find the repeat blocks and easily add them to complete the task. Download the Dash There and Back Challenge Cards. Once the first graders were comfortable with the challenge tasks, we started adding sounds and other blocks to our code. I hope to come up with several other challenges for the students over the next few weeks. I am also considering using something like this Blockly menu with icon pictures. I do have a few 1st graders who could benefit from the picture support. I will share these cards once I have tried them out with students. Have you used Dash with 1st graders? I would love to hear your ideas! Today's science fair themed Webmix Wednesday provided me with the perfect opportunity to bring together some great resources! The webmix contains sites for finding project ideas, learning about the scientific method, and exploring virtual science experiments. I love the virtual experiments from Discovery Science! How Does Your Garden Grow Virtual Lab involves changing variables to find the perfect conditions for growing tomatoes. Critters! Virtual Lab involves using variables to find the perfect conditions for a fuzzy creature to live. Both labs engage students and do a great job of reinforcing the scientific method. Hope this webmix helps you and your students get your SCIENCE on!